If you are looking for new exterior siding for your home in Naperville, Illinois, or another nearby area, consider working with the exterior remodeling experts at Euro-Tech. We are proud to be the exclusive dealer of a specially formulated composite siding manufactured by Crane, called Millrun Siding. This high-performance cladding features Neopor® insulation from BASF, which can reduce the thermal conductivity of your walls and create a more comfortable indoor living environment year-round. Beautiful – With a true-milled cedar woodgrain finish, Millrun siding offers a classic American aesthetic that will surely beautify your home. Durable – Millrun siding is 300 percent more impact resistant than fiber cement and it’s backed with a spectacular non-prorated, fully transferable lifetime warranty. 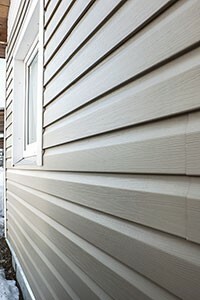 Easy to maintain – Unlike wood and some other types of cladding, composite siding doesn’t have to be painted or scraped, which can save the time and money otherwise spent on these recurring tasks. At Euro-Tech, we not only provide industry-leading exterior siding, but also expert siding installation. In fact, all of our installations are carried out by experienced industry professionals, so, with us, you can be certain that your siding will be installed the right way, the first time. For more information about the exterior siding that we install for homeowners in Naperville, IL, and nearby areas, contact Euro-Tech today. When you do, ask to schedule your free consultation and estimate.